There are a number of good birding possibilities in the vicinity of the village of Straiton (NS 8 04) on the edge of Galloway Forest Park in the Southern Uplands. Buses run regularly betweenAyr and Straiton and one companycarries cycles. The village lies on the local cycle byway network (see Ayrshire Paths website for details) and all the birdwatching locations suggested are easily accessible from there by bike. A small car park at the entrance to Straiton from the Ayr side provides a pleasant picnic site beside the River Girvan and is the start of a number of local waymarked walks on which information is available in leaflets from tourist offices and dispensers or from Ayrshire Path’s web site. The village has toilets, a cafe and inn. The recommended birdwatching locations include one of these walks, though any of the others could also be rewarding. 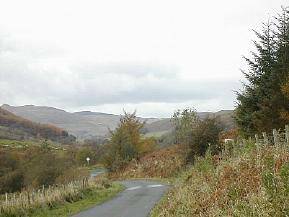 The other locations are further up into the hills along the Straiton-Newton Stewart road. Should be accessible in part, further details to be posted on the website in due course. Straiton on local byway network, linked to National Cycle Route 7. All locations easily reached by bike. This .5 km walk starts in Straiton from the car park and passes the award winning Fowler’s Croft Development. Itthen follows the B741 past Largs Farm, home to a covenanting martyr,and into the mixed woodland of Lambdoughty glen (NS 89 052) with its sparkling burn and falls, the largest a 10m drop. Birds:The woodland is good for Jay, Kestrel, Siskin and Redpoll . Red Squirrel and Otter have been seen in the glen. This is a private estate, home to the Hunter Blairs, which opens to the public at certain times in the summer. 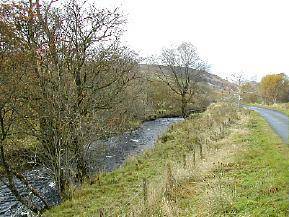 It has a fine mixture of woodland and the River Girvan flows through. The quiet roads around the perimeter are suitable for cycling, strolling or gentle exploration by car. Birds: Typically Buzzard, Tree Pipit, Dipper, Redstart, Garden Warbler, Blackcap, Wood Warbler, Pied Flycatcher. The road, signposted Loch Bradan,starts at the Tairlaw Bridge (NS 402 009), 5km up the B740 from Straiton, andruns for 6 km following the River Girvan to its outflow from the loch. Park at the Tairlaw Bridge or by the roadside on the better first 2 km of the road. Walk or cycle the rest of the way to the loch. Birds<: Very good in spring for migrants. The river has Dipper and Grey Wagtail . A car park and picnic site (NX 98 958) with glorious views over the surrounding moors and forests lies just off the Straiton-Newton Stewart road about 11km up from Straiton and is the start of the Cornish Hill Walk. The byway links with a forest cycle route between Loch Doon and the village of Barr. Cars may access forest roads along this byway, subject to forest operating circumstances, and are sometimes permitted to pass right through to Loch Doon in East Ayrshire along the cycle route. Birds: The 4km stretch of the byway to Ballochbeatties (NX 419 956) passes through conifer stands and patches of mixed woodland out onto open moor. It is good for Meadow Pipit, Bullfinch, Song Thrush and Buzzard . Black Grouse may be seen in the trees beside the road, especially in the spring. Siskin and Crossbill maybe seen during a good spruce cone year. 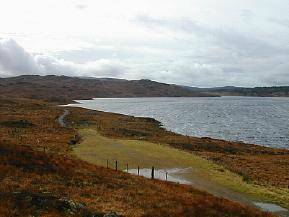 Loch Bradan:can be viewed from various points on the forest drive andthe car park at NX 408 979. Criglure Cairn: a footpath starts at NS 409 972 and goes up to the cairn. Loch Skelloch:can be viewed from a quarry car park overlooking the loch at NX 411 963.